19% of materials used in the project consist of recycled content. 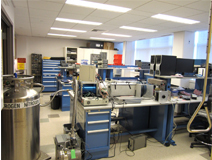 The Stubbs Laboratory is a 2,035 square foot dry lab space within the Gordon McKay Building. The renovated area supports the research of Professor Christopher Stubbs and his team of undergraduate students, graduate students, postdoctoral associates and technical staff. The space has been designed to accommodate the study of dark energy, dark matter, and related aspects of fundamental physics. The new lab will provide working space for the development of hardware and software that will enable inquiry into the most pressing questions in fundamental physics. In support of Harvard University’s goal to reduce greenhouse gas emissions 30% below 2006 levels by 2016, inclusive of growth, the Harvard Faculty of Arts and Sciences (FAS) and the design and construction team were committed to sustainability throughout the duration of the project. Decision making was performed with sustainability in mind during the selection of materials and design of mechanical systems. The lab is the 30th LEED Gold certified space at Harvard University.